So for Valentine’s Day this year my wife and I decided we are going to go to J Alexander’s for dinner. The unfortunate thing is J Alexanders doesn’t accept reservations for dinner so I stop on Feb. 9th to see how they were going to handle Saturday night. I was told that they were still going to do call ahead starting at 4:30pm and we could get on a waiting list that way. So when 4:30pm rolled around on Saturday I called, busy, again, busy, again, busy. I call for 10 minutes and every time it was busy and the one time it did ring through there was no answer. So I told my wife we best get going and go there about 5:10 on Saturday night to a line out the door. We got in line and I started to sweat. I had no backup plan. We stood in line for a few moments when the maitre d who was taking down names and party sizes said they were running a 4.5 HOUR wait. I love J Alexanders but not that much and we needed to act fast if I was going to salvage the night. So with no backup reservations in hand I opened up my Open Table iphone app and was shocked to see a few places still had 6:00pm & 6:30 reservations available. One of those places was Plaza III. So clicked that button lightening fast and we proceeded to drive down to the Plaza, KC’s Valentine’s Day holy land. We arrived about 10 minutes early and they sat us right away. We got seated in one of the most center booths in the restaurant, that was quite an odd shape for a party of two but hey Im not complaining. This booth was ideal for people watching and there were plenty of memorable folks to observe. The couple behind us had just moved back from Arizona and were celebrating 50 plus years of marriage and they said they had been coming to the Plaza III for years. 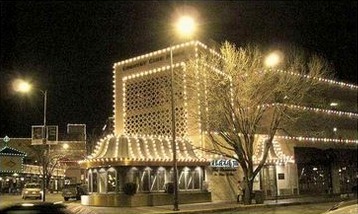 Im guessing not much has change at the Plaza III over the last 30 years. The place seems a bit dated, Im sure it was quite the place 30 years ago but honestly it could use a makeover. The etched harness racing windows are about 5 years away from showing up on the antique roadshow. We both ordered the Fillet as we would have at J Alexanders. I got the loaded baked potato and my wife got the medallion potatoes which she loved. The food was good but a bit overpriced in my opinion. My wife lover her fillet better than J Alexanders but I would have preferred the J Alexander filet mignon and baker for half the price, which is maybe why they had the 4.5 hour wait and I could still get a reservation at Plaza III on Valentine’s Day. I’ll probably eat again at Plaza III but its never going to make my recommendation list under its current form, but I will say the people watching was superb.